Summer is a busy time for me and I still want to sew or should I say I need to sew. Sewing is a passion and when I cannot get to my sewing room, I get a little grumpy! Anyone else like that? That being said I have a conflict in the summer besides time. It is the great outdoors, well, really just my yard. I love to work in my flowers and be in the pool. To keep from being grumpy from lack of sewing, my solution is faster projects and fabulous fabric. I fell in love with this Mood Fabrics' Navy, Oatmeal and Gray Awning Striped Jersey and quickly put it in my cart, you better hurry, too, as it is almost sold out. These are not your colors? Don't worry check out these Striped Jerseys or these Solid Jerseys. 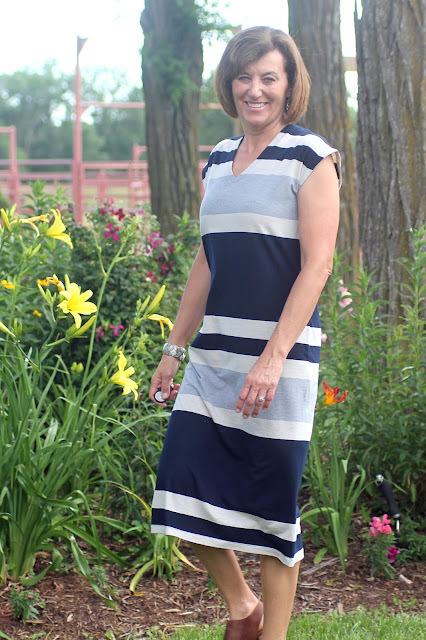 Next up was to pick out a pattern for this great striped fabric and I went with True Bias Lodo Dress. This dress had a nice shape and limited seams! I had plenty of fabric so I played with the placement of the stripe. I decided to use the thicker navy stripe at the waist and then carefully matched the side seams and the back seam. I loved the shape of this dress but one of my daughters suggested that I shape the waist a bit. I did follow her advice and it made a difference. The Lodo Dress uses a woven fabric (quilting cotton weight) for the neck facing and arm facing. This works so nicely for stabilizing those areas. The dress has two lengths and I went with the longer length and this view has a small slit in the back for walking ease. I made one small mistake on this dress, I sewed the armholes a bit too small, thus the drag lines. When I realized my mistake, I went to unsew and oops, a hole in my fabric. I decided it wasn't worth the chance of ruining my dress. Next time I will mark a bit more carefully and assure the correct size. This picture shows those lines. 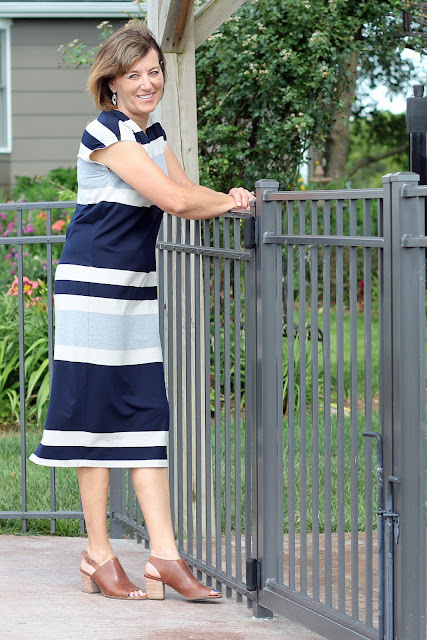 When looking for fabric for this dress, note the suggested fabric states "Medium weight stable knit fabric with an approximate 25% stretch such as ponte, cotton interlock, and lightweight scuba." So here is Mood Fabrics' Ponte or Mood Fabrics' Interlock or Mood Fabrics' Scuba Knit. My fabric was very stable and I feel works perfectly for my dress. I have just a bit left of the knit and hoping I can squeeze out a top, too. Love your stylish dress. You picked the perfect pattern to show off the fabric. You look gorgeous in this fabulous dress. Nice summery dress! I also love when you work in your garden ... it always looks so pretty in your pics. This is a great dress -I love how the longer version is so flattering. Great stripe placement . We are outside only when we have to. Nighttime swimming when it's 115 is such a treat! 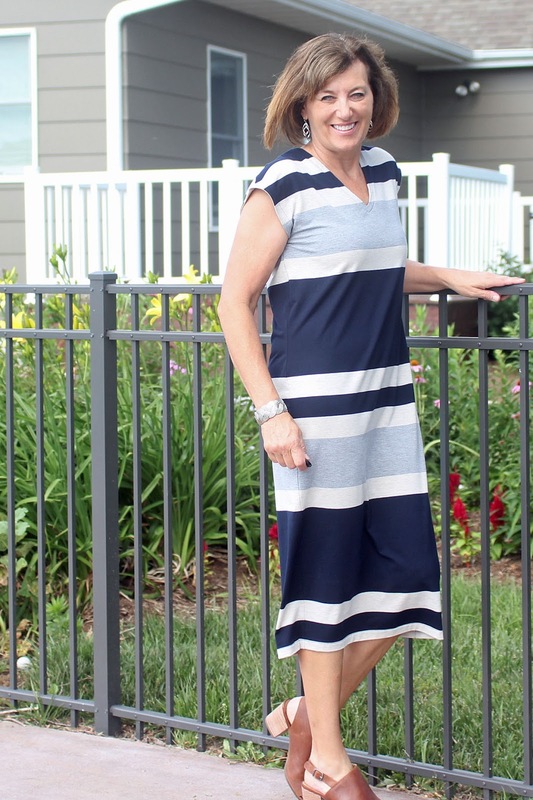 Love this dress with the bold stripe! These kind of prints always stump me, but it's perfect. Great dress! Perfect pattern for that fabric! You look great in this style! That's interesting that it uses a woven facing. I have struggled with v-neck knit tops with facings because they always seem to roll out. Maybe I'll give the woven facing idea a try. I also am a gardener and am torn between sewing and gardening on a daily basis! Usually the weather decides for me. cute, the fabric is what makes it. You picked just the right stripe for your dress, it's gorgeous too. I just purchased the pattern, thinking on making one for my Mom. You look good in that dress. Not everyone can carry off stripes. Looks comfortable too. Win win. I looked at the fabric on Mood's site I'm not understanding that it's sold in panels. How many panels did it take for the dress. It's very flattering! You look awesome and I love that fabric, too! Great dress! Those stripes are perfect. Absolutely beautiful. It isn't easy to look so tall and lean in horizontal stripes, but you do precisely that in this adorable dress. Bravo!